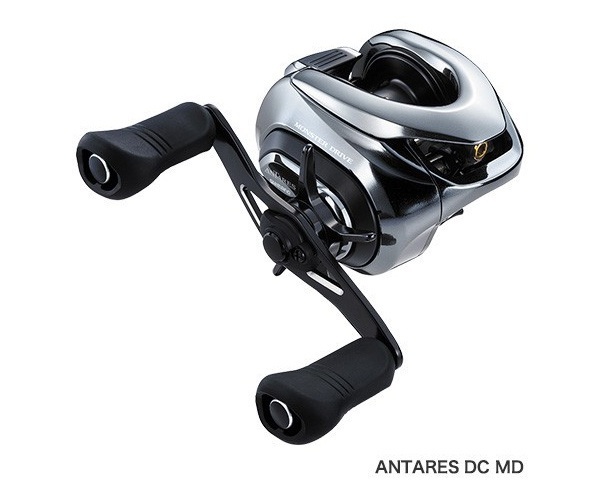 Shimano's high-end low profiled bait caster, Antares DC is now tuned to catch the monsters, and named Monster Drive MD. The main tarket water is Amazon, where 5kg, 10kg and much larger freshwater monsters hide. To maximize the chance to catch them, Antared DC MD has as fast gear as possible, tuned DC brake system to cast bulky swim baits far. Its XB tuned 4x8 DC computer controled brake system at dial 5 to 8 emits flash brake to correct flying positions of bulky swimbaits to fly like rocket. Drag is souped up to 6kg. Handle is enlonged to 90mm. 4 modes, FL: fluorocarbon line mode, P: PE braided line mode, NM: Nylon monofilament mode, X: extreme long cast mode. Please set one from these 4 to suite your line chosen. X should be chosen to cast the longest with heavier than 5/8oz rigs in slim shapes.